CMCC and EIEE senior researcher Elena Verdolini explains how the energy sector, the largest producer of greenhouse gases, is surprisingly one of the easiest areas to decarbonise. Electrification is growing fast as it becomes increasingly low-carbon or carbon-free entirely. Dr Verdolini explains how variability is a major obstacle to increasing the use of renewables and goes on to talk about the best ways to tackle the increasingly difficult obstacles this sector faces. This article addresses the impact of the European Union Emissions Trading System (EU ETS) on Poland’s conventional energy sector in 2008 – 2020 and further till 2050. Poland is a country with over 80% dependence on coal in the power sector being under political pressure of the European Union’s (EU) ambitious climate policy. The impact of the increase of the European Emission Allowance (EUA) price on fossil fuel power sector has been modelled for different scenarios. The innovation of this article consists in proposing a methodology of estimation actual costs and benefits of power stations in a country with a heavily coal-dependent power sector in the process of transition to a low-carbon economy. Strong political and economic interdependence of coal and power sector has been demonstrated as well as the impact caused by the EU ETS participation in different technology groups of power plants. It has been shown that gas-fuelled combined heat and power units are less vulnerable to the EU ETS-related costs, whereas the hard coal-fired plants may lose their profitability soon after 2020. Lignite power plants, despite their high emissivity, may longer remain in operation owing to low operational costs. Additionally, the results of long-term, up to 2050, modelling of Poland’s energy sector supported an unavoidable need of deep decarbonisation of the power sector to meet the post-Paris climate objectives. It has been concluded that investing in coal- based power capacity may lead to a carbon lock-in of the power sector. Finally, the overall costs of such a transformation have been discussed and confronted with the financial support offered by the EU. The whole consideration has been made in a wide context of changes ongoing globally in energy markets and compared with some other countries seeking trans-formation paths from coal. Poland’s case can serve as a lesson for all countries trying to reducecoal dependence in power generation. Reforms in the energy sector shall from the very beginning be an essential part of a sustainable transition of the whole nation’s economy. They must scale the power capacity to the future demand avoiding stranded costs. The reforms must be wide-ranging, based on a wide political consensus and not biased against the coal sector. Future energy mix and corresponding technologies shall be carefully designed, matched and should remain stable in the long-term perspective. Coal-based power capacity being near the end of its lifetime provides an economically viable option to commence a fuel switch and the following technology replacement. Real benefits and costs of the energy transition shall be fairly allocated to all stakeholders and communicated to the society. The social costs and implications in coal-dependent regions may be high, especially in the short-term perspective, but then the transformation will bring profits to the whole society. On 21 September, Utrecht University School of Economics (U.S.E.) hosted the workshop “Dynamics of low-carbon energy finance” as part of the EU commission sponsored Horizon 2020 project INNOPATHS. In three consecutive sessions, 18 participants from the financial sector, international organisations and academia discussed the financial implications of a low-carbon transition of the European Economy until 2050. Future energy scenarios and corresponding technology mixes have differential implications for the sources of finance. Especially energy efficiency projects pose challenges to banks and other institutional investors. But also renewable power projects still face technology operation risks and political risks. In addition to debt-providers, the energy transition requires risk-bearing capacity. In this regard state investment banks that prove the investment case are crucial for financing innovative energy technologies. We must move faster towards a low-carbon world if we are to limit global warming to 2oC this century, experts have warned. 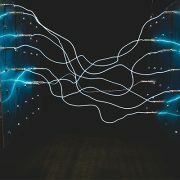 Changes in electricity, heat, buildings, industry and transport are needed rapidly and must happen all together, according to research from our partners at the Universities of Sussex. The new study, published in the journal Science, was co-authored by INNOPATHS’ Benjamin K. Sovacool. To provide a reasonable (66%) chance of limiting global temperature increases to below 2oC, the International Energy Agency and International Renewable Energy Agency suggest that global energy-related carbon emissions must peak by 2020 and fall by more than 70% in the next 35 years. This implies a tripling of the annual rate of energy efficiency improvement, retrofitting the entire building stock, generating 95% of electricity from low-carbon sources by 2050 and shifting almost entirely towards electric cars. This elemental challenge necessitates “deep decarbonisation” of electricity, transport, heat, industrial, forestry and agricultural systems across the world. But despite the recent rapid growth in renewable electricity generation, the rate of progress towards this wider goal remains slow. Moreover, many energy and climate researchers remain wedded to disciplinary approaches that focus on a single piece of the low-carbon transition puzzle. A case in point is a recent Science Policy Forum proposing a ‘carbon law’ that will guarantee that zero-emissions are reached. This model-based prescription emphasizes a single policy instrument, but neglects the wider political, cultural, business, and social drivers of low carbon transitions. A new, interdisciplinary study published in Science presents a ‘sociotechnical’ framework that explains how these different drivers can interlink and mutually reinforce one another and how the pace of the low carbon transition can be accelerated. The Policy Forum provides four key lessons for how to accelerate sustainability transitions. Rapid and deep decarbonization requires a transformation of ‘sociotechnical systems’ – the interlinked mix of technologies, infrastructures, organizations, markets, regulations and user practices that together deliver societal functions such as personal mobility. Previous systems have developed over many decades, and the alignment and co-evolution of their elements makes them resistant to change. Socio-technical transitions gain momentum when multiple innovations are linked together, improving the functionality of each and acting in combination to reconfigure systems. The shale gas revolution, for instance, accelerated when seismic imaging, horizontal drilling, and hydraulic fracturing were combined. Likewise, accelerated low-carbon transitions in electricity depend not only on the momentum of renewable energy innovations like wind, solar-PV and bio-energy, but also on complementary innovations including energy storage and demand response. These need aligned and then linked so that innovations are harmonized. 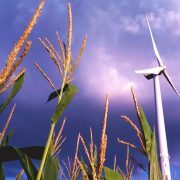 Prof. EU INNOPATHS consortium researching low-carbon transitions for Europe, comments: “One of the great strengths of this study is the equal emphasis it accords to technological, social, business and policy innovation, in all of which governments as well as the private sector have a key role to play. Public support is crucial for effective transition policies. Low-carbon transitions in mobility, agro-food, heat and buildings will also involve millions of citizens who need to modify their purchase decisions, user practices, beliefs, cultural conventions and skills. To motivate citizens, financial incentives and information about climate change threats need to be complemented by positive discourses about the economic, social and cultural benefits of low-carbon innovations. Furthermore, business support is essential because the development and deployment of low-carbon innovations depends upon the technical skills, organizational capabilities and financial resources of the private sector. Green industries and supply chains can solidify political coalitions supporting ambitious climate policies and provide a counterweight to incumbents. Technological progress can drive climate policy by providing solutions or altering economic interests. Shale gas and solar-PV developments, for instance, altered the US and Chinese positions in the international climate negotiations. For instance, the UK transition to smokeless solid fuels and gas was accelerated by the 1956 Clean Air Act, which allowed cities to create smokeless zones where coal use was banned. Another example is the 2009 European Commission decision to phase-out incandescent light bulbs, which accelerated the shift to compact fluorescents and LEDs. French and UK governments have announced plans to phase-out petrol and diesel cars by 2040. Moreover, the UK intends to phase out unabated coal-fired power generation by 2025 (if feasible alternatives are available). Phasing out existing systems accelerates transitions by creating space for niche-innovations and removing barriers to their diffusion. The phase-out of carbon-intensive systems is also essential to prevent the bulk of fossil fuel reserves from being burned, which would obliterate the 2oC target. This phase-out will be challenging since it threatens the largest and most powerful global industries (e.g. oil, automobiles, electric utilities, agro-food, steel), which will fight to protect their vested economic and political interests. While full integration of both approaches is not possible, productive bridging strategies may enable policy strategies that are both cost-effective and socio-politically feasible. This article was originally posted on the University of Sussex website. Click here to read the full paper in Science. 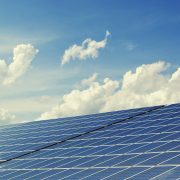 Is the IEA still underestimating the potential of photovoltaics? Photovoltaics (PV) has become the cheapest source of electricity in many countries. Is it likely that the impressive growth observed over the last decade – every two years, capacity roughly doubled – will be sustained, and is there a limit to the growth of PV? In a recently published article (Creutzig et al 2017), we tackle this question by first scrutinizing why past scenarios have consistently underestimated real-world PV deployment, analyzing future challenges to PV growth, and developing improved scenarios. We find that if stringent global climate policy is enacted and potential barriers to deployment are addressed, PV could cost-competitively supply 30-50% of global electricity by 2050. Any energy researcher knows that projecting energy use and technology deployment is notoriously challenging, and the results are never right. Still, the consistent underestimation of PV deployment across the different publications by various research groups and NGOs is striking. As an example, real-world PV capacity in 2015 was a factor 10 higher than projected by the IEA just 9 years before (IEA, 2006). 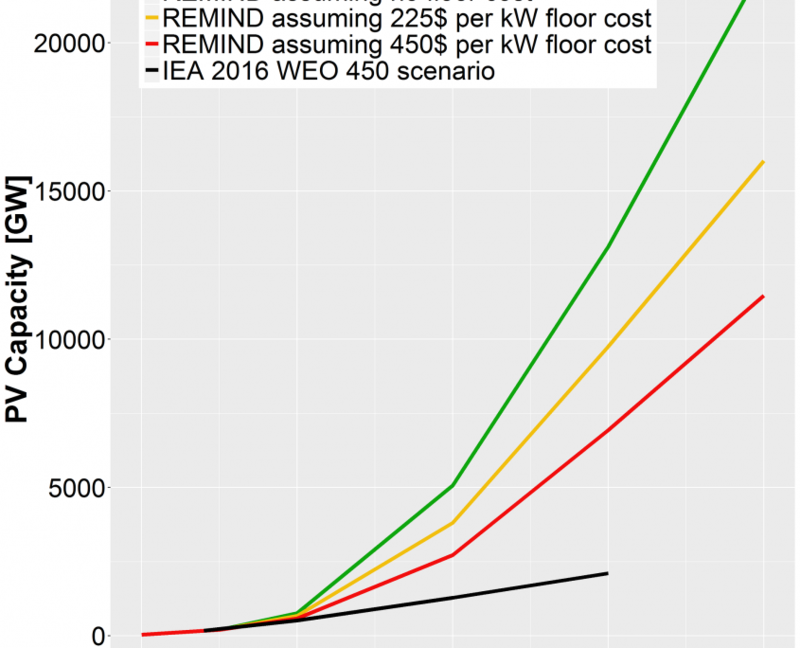 doubling of cumulative PV capacity lead to a system price decrease of roughly 20%. With substantial support policies such as feed-in-tariffs in many countries including Germany, Spain and China, or tax credits in the USA, the learning curve was realized much faster than expected, which in turn triggered larger deployments. These factors together have led to an average annual global PV growth rate of 48% between 2006 and 2016. Can continued fast growth of PV be taken as a given? We think not. Two potential barriers could hinder continued growth along the lines seen over the last decade, if they are not addressed properly: integration challenges, and the cost of financing. Output from PV plants is variable, and thus different from the dispatchable output from gas or coal power plants. However, power systems have always had to deal with variability, as electricity demand is highly variable. Thus, a certain amount of additional variability can be added to a power system without requiring huge changes, as examples like Denmark, Ireland, Spain, Lithuania or New Zealand show: In these countries wind and solar power generates more than 20% of total electricity, while maintaining a high quality of power supply (IEA, 2017). Under certain conditions wind and solar can even increase system stability. In fact, the size of the integration challenge largely depends on how well the generation pattern from renewable plants matches the load curve. Accordingly, in regions with high use of air conditioning such as Spain or the Middle East, adding PV can benefit the grid: On sunny summer afternoons when electricity demand from air conditioning is high, electricity generation from PV is also high. As the share of solar and wind increases beyond 20-30%, the challenges increase. Still, there are many options for addressing these challenges, including institutional options like grid code reforms or changes to power market designs in order to remove barriers that limit the provision of flexibility, as well as technical options like transmission grid expansion or deployment of short-term storage (IEA, 2014a). None of these options is a silver bullet, and each has a different relevance in different countries, but together they can enable high generation shares from photovoltaics and wind of 50% and beyond. Many developing countries have a very good solar resource and would benefit strongly from using PV to produce the electricity needed for development. However, because of (perceived) political and exchange rate risks as well as uncertain financial and regulatory conditions, financing costs in most developing countries are above 10% p.a., sometimes even substantially higher. 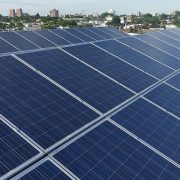 Why does this high financing cost matter for PV deployment? 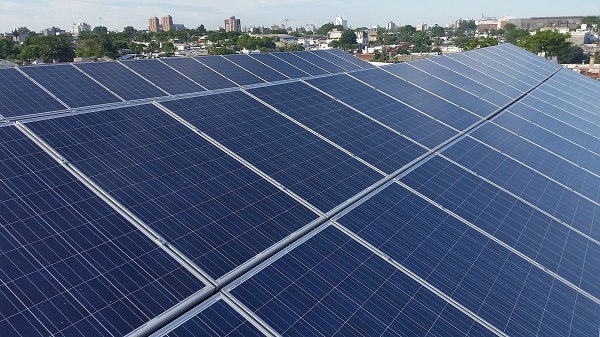 One of the main differences between a PV plant and a gas power plant is the ratio of up-front investment costs to costs incurred during the lifetime, such as fuel costs or operation and maintenance costs. For a gas power plant, the up-front investment makes up less than 15% of the total (undiscounted) cost, while for a PV plant, it represents more than 70%. Thus, high financing costs are a much stronger barrier for PV – the IEA calculated that even at only 9% interest rate, half of the money for PV electricity is going into interest payments (IEA, 2014b)! Clearly, reducing the financing costs is a major lever to enable PV growth in developing countries. 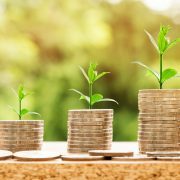 Financial guarantees from international organizations such as the Green Climate Fund, the World Bank or the Asian Infrastructure Investment bank could unlock huge amounts of private capital at substantially lower interest rates. Such action could help to leapfrog the coal-intensive development path seen, e.g., in the EU, US, China or India. Replacing coal with PV would alleviate air pollution, which is a major concern in many countries today – in India alone, outdoor air pollution causes more than 600,000 premature deaths per year (IEA, 2016a). How will future PV deployment unfold if measures to overcome the potential barriers integration and financing are implemented? To answer this question, we use the energy-economy-climate model REMIND and feed it with up-to-date information on technology costs, integration challenges and technology policies. The scenarios show that under a stringent climate policy in line with the 2°C target, PV will become the main pillar of electricity generation in many countries. We find a complete transformation of the power system: Depending on how long the technological learning curve observed over the past decades will continue in the future, the cost-competitive share of PV in 2050 global electricity production would be 30-50%! Our scenarios show that the IEA is still underestimating PV. The capacity we calculate for 2040 is a factor of 3-6 higher than the most optimistic scenario in the 2016 World Energy Outlook (IEA, 2016b). We conclude that realizing such growth would require policy makers and business to overcome organizational and financial challenges, but would offer the most-affordable clean energy solution for many. As long as important actors underestimate the potential contribution of photovoltaics to climate change mitigation, investments will be misdirected and business opportunities missed. To achieve a stable power system with 20-30% solar electricity in 15 years, the right actions need to be initiated now. IEA, 2017. Getting Wind and Sun onto the Grid. OECD, Paris, France. IEA, 2016a. World Energy Outlook Special Report 2016: Energy and Air Pollution. OECD, Paris, France. IEA, 2016b. WEO – World Energy Outlook 2016. OECD/IEA, Paris, France. IEA, 2014a. The Power of Transformation: Wind, Sun and the Economics of Flexible Power Systems. OECD, Paris, France. IEA, 2014b. Technology Roadmap: Solar photovoltaic energy. OECD/IEA. IEA, 2006. World Energy Outlook 2006. IEA/OECD, Paris, France. https://innopaths.eu/wp-content/uploads/2017/08/solar-energy-868663_1920.jpg 337 600 Robert Pietzcker https://innopaths.eu/wp-content/uploads/2017/03/innopaths-logo.png Robert Pietzcker2017-08-31 09:30:452018-05-04 10:12:24Is the IEA still underestimating the potential of photovoltaics? In November 2016, the European Commission presented the ‘Clean Energy for all Europeans’, (i.e. ‘Winter package’), a set of measures to keep the European Union competitive as the clean energy transition is changing global energy markets. The package proposes policies in line with the 2030 targets agreed by the European Council in 2014 regarding GHG emissions reduction, renewable energy and energy efficiency. The PRIMES model, developed by E3M, has been used to build the EU Reference Scenario 2016 and support the Impact Assessment studies that accompany the Winter Package [1-4]. Figure 1 shows schematically that individual parts of the Winter Package where the PRIMES model has been used and the various scenarios considered. In addition to the proposals included in the Winter Package, additional framework related to the decarbonisation of transport and the effort sharing amongst Member States towards the reduction of GHG emissions has also been proposed in the context of the targets set by the European Council. PRIMES was also used in those assessments. PRIMES is a partial equilibrium modelling system that simulates an energy market equilibrium in the European Union and in each of its Member States. The model includes consistent EU carbon price trajectories. It proceeds in five-year steps and uses Eurostat data. Several scenarios were considered. The main scenario, EUCO27 is in line 2014 European Council. It considers at least 40% cuts in greenhouse gas emissions (from 1990 levels), at least 27% share for renewable energy and at least 27% improvement in energy efficiency. Four variants to the EUCO27, considering different levels of energy efficiency improvements (30, 33, 35 and 40%) were also considered to assess the impact of the proposed legal framework on energy efficiency. Other scenarios related to the integration of Renewable Energy Sources (RES) and the functioning of the internal energy market were also developed and used to assess the various implications of the winter package. All EUCO scenarios are decarbonisation scenarios, i.e. they are compatible with a 2oC trajectory and the EU INDC  submitted following the COP21 meeting in Paris in 2015. They achieve above 80% GHG emissions reduction in 2050 compared to 1990 levels, in line with the European Commission ‘Energy Roadmap 2050’. Table 1 shows the main policies used for delivering the climate and energy targets in all scenarios. The energy related CO2 emissions decrease primarily in the energy supply sectors, notably in the power sector, but also in the demand sectors. 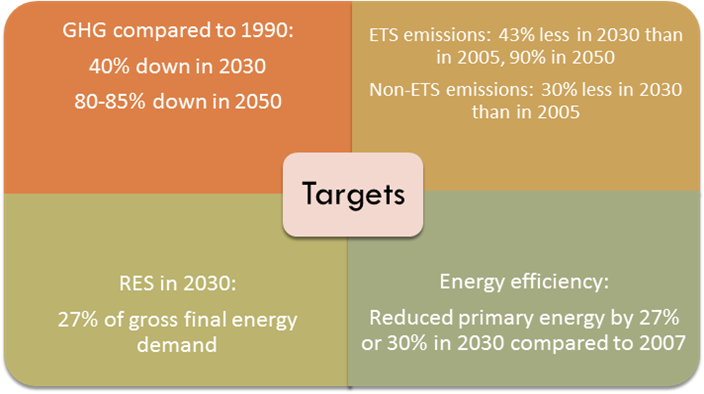 The ETS drives strong emission reductions in the power sector and promotes the development of RES which benefit from learning-by-doing requiring low or no out-of-the-market support. Variable renewables (e.g. wind and solar)_ are expected to dominate the power generation sector. The projection shows variable RES capacity to more than double in 2030, from 2015 levels, and quadruple by 2050. RES in heating and cooling also develop, albeit at a slower pace, driven by heat pumps and RES-based production of heat. The biofuels in transport constitute the main growing market for bioenergy, as biofuels are essential for reducing emissions in non-electrified transport segments (the RES-T includes for electricity used in transport the RES used in power sector). Due to the increased penetration of intermittent RES, gas-firing capacities acquire a strategic role for balancing and reserve, a role increasingly performed by storage technologies in the long term. Nuclear plant retrofitting is essential to maintain total nuclear capacity, as investment in new nuclear plants suffers from limitations (sites, financing, etc.). Coal-firing generation is under strong decline with CCS not becoming a major option. The model results confirm the importance of sharing balancing and reserve resources across the EU countries and the advantages of market coupling in the day-ahead, intra-day and real-time balancing. The scenarios assume minimization of costs over the pan-European market, which in the mid-term becomes fully integrated. (E) Renovation of houses and buildings, the Eco-design regulation, the application of the Best Available Technologies (BAT) in the industry are significant enablers to energy efficiency. 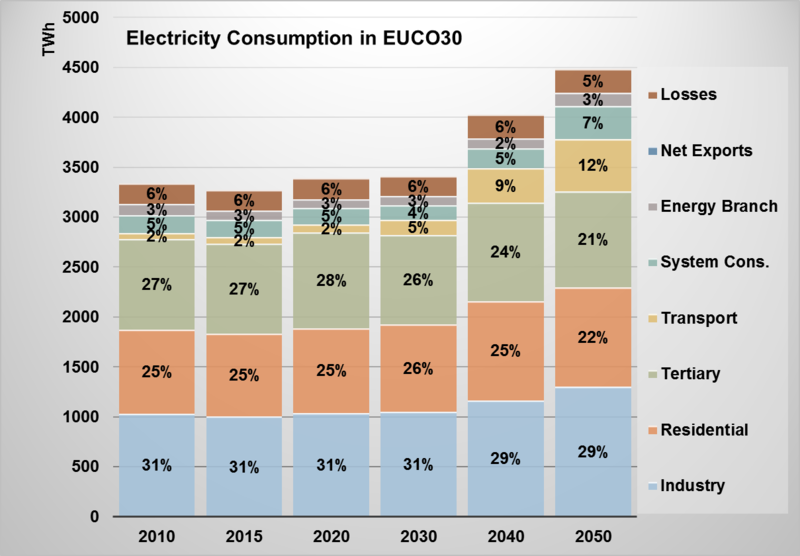 (F) Electricity consumption hardly increases until 2030. The energy efficiency improvement drives electricity savings in the short/medium term, and energy savings overall. Transport electrification and increased use of electricity for heat purposes add significant load, but only after 2030. Advanced car technologies (mainly plug-in hybrids and battery electric vehicles) dominate the car market as a result of the CO2 car standards, which continuously tighten. The biofuels, mostly advanced lignocellulose-based fungible biofuels in the long term, get a significant market share in the non-electrified segments of the transport sector (trucks, ships, aircrafts). Investment expenditures are likely to rise considerably in the decade 2020-2030 and beyond. The projections do not see significant pressures on electricity prices in the medium term, but prices are likely to considerably increase in the long term, mainly due to increasing costs of grids and system services. Moderate increase in total costs relative to the Reference in EUCO27 and EUCO30. There’s considerable increase in investment in the demand sectors when the energy efficiency ambition increases. The induced technology progress can offset the increase in the energy costs in the long term. The investment expenditures are likely to rise considerably in the decade 2020-30, a crucial decade for the energy transition, also because of the necessity to extend power grids, upgrade power distribution, build vehicle recharging infrastructure and develop advanced biofuels. The investment requirements in gas-fired plants are significant after 2025 and until 2050, in contrast to the continuous decrease in the rate of use. The investment in nuclear both for extension of lifetime and new plants is also significant. The investment outlook is dominated by the massive development of variable RES, notably wind and solar. On average, the prices of electricity in the EUCO scenarios do not increase in 2030 compared to the Reference projection. The projections do not see significant pressures on electricity prices in the medium term. The electricity sector restructuring, the sharing of resources in the integrated EU market and the technology learning offset the impacts of ETS. The projection of rising electricity prices in the long term is mainly due to the increasing costs of grids, smart systems and system services. However, the prices increase significantly after 2030. By Pantelis Capros, Professor in the School of Electrical and Computer Engineering, National Technical University of Athens and Director of the E3Mlab/ ICCS. European Commission, COM(2016) 767 final/2, 0382 (COD) (2017) 1–116. European Commission, COM(2016) 761 final. http://ec.europa.eu/energy/sites/ener/files/documents/1_en_act_part1_v16.pdf. European Commission, Impact assessment on the revised rules for the electricity market, risk preparedness and ACER, Eur. Comm. Winter Packag. 5 (2016). The EU’s Intended Nationally Determined Contribution to the UNFCCC. Projects funded under the Horizon2020 funding programme contributed to the DG Research and Innovation & EASME coordinated policy session on ‘How economic and social actors can champion CO2 phase-out’ which took place on 22 June in Brussels. Can deep decarbonisation pathways be reconciled with the political objectives of reinvigorating European industries and strengthening economic competitiveness? What does science have to say about the risks and opportunities related to innovation, deployment, financing or public acceptance? INNOPATHS will also contribute to the work of a high-level expert panel, established by the European Commission (DG Research and Innovation), which prepares a report on the research and innovation challenges that will have to be tackled on the way towards the full decarbonisation of the European economy. This report will be published mid-2018. 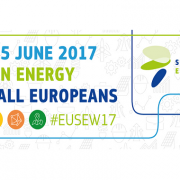 A copy of the presentation slides are available on the EUSEW2017 website. 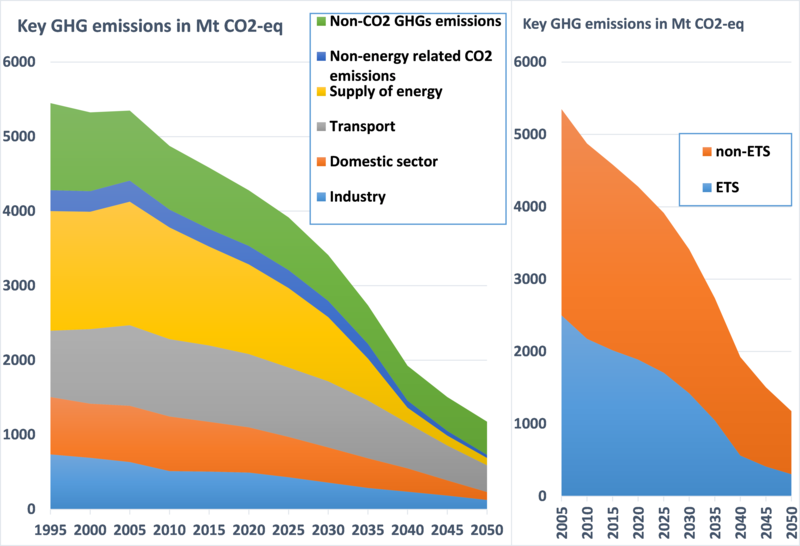 What are the major challenges that emission intensive sectors face in order to transition towards decarbonization? What technical and organizational innovations can they rely on? What are the key actors involved in the decarbonization process? Who is set to lose, and who is set to benefit, from this major restructuring of EU economies? 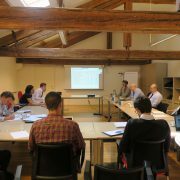 Such questions, amongst others, were addressed during six Stakeholder Workshops organized at the CMCC Foundation (Euro-Mediterranean Center on Climate Change) offices in Venice on May 3rd and 4th, 2017, as part of the INNOPATHS project. These six workshops, focused on six sectors of particular importance to the low-carbon transition – power, buildings, transport, agriculture, industry and Information and Communication Technologies (ICT) and allowed for the exchange and discussion of views from invited sector stakeholders on the key actors, technologies and policies of relevance in each sector, and the enablers and barriers to the energy transition. Discussions in the workshops were very lively. All workshops concluded that a successful decarbonization of the EU economy depends on the presence of well-designed, stable policy instruments, tailored for sector-specific needs and appropriate across diverse EU member states. A key requirement for this is the continual engagement of and dialogue between the policy-making community, technology developers, researchers and the European citizenry. It was noted that, in some cases, institutions and policy instruments were successful in incentivizing innovation through rules, laws and incentive mechanisms. In others, however, they slowed down and sometimes blocked the innovation process for example with the bureaucratic burden, effectively making the decarbonization process more difficult. Several sector-specific challenges were also discussed. In the Power Sector, stakeholders agreed that there is a broad consensus on the key generation technologies that will play a role in the transition (e.g., solar PV and gas as a transition mid-term option), although the specific combination and trajectory over time will vary by member state. The real game changers, however, will be the ‘enabling’ technologies – particularly electricity storage – which have the potential to turn the current energy system on its head, by allowing the system to move beyond instantaneous matching of generation and demand. The development of new institutions, and particularly new business models, to support the deployment of these technologies is crucial. The Buildings Sector faces tremendous challenges, including retrofitting the existing stock for energy efficiency and integrating ICT technologies. Buildings owners and occupants are often unaware of the benefits that could be achieved by investing to increase energy efficiency, and lack of access to finance to pay for high up-front costs with long payback times (over 20 years) compounds the issue. Co-ordination issues in multi-ownership and multi-occupancy buildings are also strong. Government policy must play a crucial role. To address these challenges, it was suggested that it is necessary to foster the retrofitting and the deployment of renewable energy in entire districts, and, to strictly enforce regulation, to invest in making the public aware of the benefits of retrofitting and energy efficiency, and to ensure that the construction industry is better skilled at delivering energy efficiency options. In the Industry Sector it was argued that much greater potential for energy efficiency gains would come from less rather than more energy-intensive sectors. Indeed, due to the large operating cost energy consumption represents, energy-intensive industries (such as chemicals, steel, cement, and glass) are already incentivized to be as energy efficient as possible. Conversely, in less energy-intensive sectors, such incentives are less strong. In these sectors, such as food processing, energy efficiency is often overlooked as a potential source of competitive advantage. For this reason, it is crucial that the government help firms identify and accept energy saving opportunities. Reducing emissions in the Transport Sector was described as a ‘battleground’, with transport effectively being ‘the problem child of climate policy’ due it its diversity: freight, aviation, public and private transport. In this sector the development of new, low carbon business models will be crucial, but other aspects related to social and cultural perceptions (e.g. status effects) also play an extremely important role. Stakeholders disagreed on the most important level of governance – EU, national, or local – for achieving low-carbon transport. Stakeholders agreed that ICT solutions will be core to the decarbonization of the sectors discussed above. A crucial concern is the amount energy that ICTs themselves consume. However, many of the barriers in this sector are social rather than technical. For example, the potentially overwhelming choice of ICT hardware and applications on the market, and what services these technologies perform and how, may confuse consumers as to which combination is suitable for them, and prevent them making any choice at all. A significant challenge in the Agriculture Sector is that the principal GHG emissions are Nitrous Oxide (N2O) and Methane (CH4) produced by biological processes, rather than carbon dioxide (CO2) from fossil fuel combustion. There are therefore limits to the reduction of such emissions whilst demand for agricultural produce remains high and grows. A shift in human diet towards vegetarianism is unlikely to become an important driver of emissions reduction given the current and expected future trend of global meat consumption. These workshops represent the beginning of what will be a continuous process of stakeholder ‘co-design’ embedded in the INNOPATHS project. While the process will be a complex one, continuous engagement and a connection between different actors – from EU policy makers to individual citizens – will help ensure that crucial aspects of the low-carbon transition are not overlooked, and are appropriately considered in achieving the core aim of INNOPATHS – the development of generating new, state-of-the-art low-carbon transition pathways for the European Union.